Trousers London is a London-based premium men’s jeanswear label recently launched by a team of four multi-disciplinary creatives. Trousers London makes jeans for the genuine modern day gentlemen, for the man who loves the thrill of the new and is always at the forefront of the avant-garde. This season, however, brings the launch of new designs for the ladies, a slim leg and a bootleg flare with the distinctive tailoring and quirks of the men’s lines. Honestly I was soo excited to finally see a creative flair and something new in terms of denim. 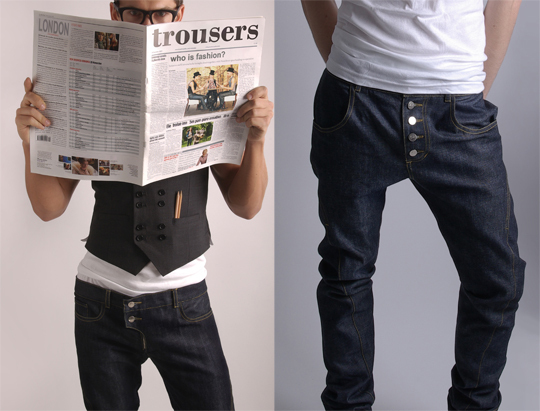 Trousers London are really pushing forward the modern denim industry. They have an online store so buy a pair before the they run out! Each line is ID’d with a unique number from 1-600 per line.